Location: Vaughn Chapel on the Ferrum College campus, 40 Wiley Drive, Ferrum, VA. This recital is open to the community and admission is free. On Friday, February 22 at 12:15 p.m., Ferrum College will host A Musical Conversation Between Friends in Vaughn Chapel on the College’s campus, 40 Wiley Drive, Ferrum. This classical voice recital is free and open to the community. 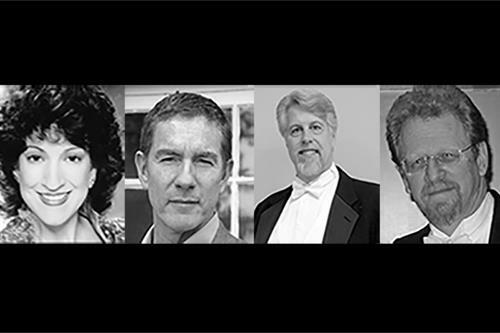 The recital will feature soprano Aimé Sposato of Ferrum College; tenor Byron Jones of Shenandoah University; bassist John Moir of Bluefield College; and pianist Robert Thieme, retired from West Virginia University; with works by Mozart, Schumann, Mendelssohn, and Strauss. Sposato has performed over 24 operatic roles and over 30 oratorios roles, receiving critical acclaim for performances in major concert halls, recital halls, and cathedrals throughout the world. She joined the leadership team of Ferrum College as provost in July 2017 and holds a faculty appointment as professor of music, voice. Jones has more than two decades experience in opera, concert, and recital in locations such as the Kennedy Center Concert Hall and Millennium Stage. He currently serves as associate professor of music (voice) and chair of the voice division at Shenandoah Conservatory of Shenandoah University. Moir has performed with the Opera Pacific, Pacific Chamber Opera, Santa Barbara Civic Opera, the Roger Wagner Chorale, and the San Diego Master Chorale, among others. He now serves as an assistant professor of music and conductor of Bluefield College’s vocal ensembles. Thieme served as co-artistic director of the American Institute of Musical Studies in Graz, Austria. He is now retired from West Virginia University, after serving as the director of the University’s opera theatre, head of accompanying, and coordinator of vocal studies from 1996-2013. To learn more, visit http://www.ferrum.edu/blog/a-musical-conversation-between-friends-ferrum-college-to-host-classical-voice-recital-on-february-22/.